Grassroots Enterprises - Brenda Herchmer Grassroots Enterprises - Article: Vice President of Photocopying? A number of years ago I did some work with a very funny, self-employed motivational speaker. As a one person operation there was a lot involved in getting himself promoted, booked and on the road. As a result he put his daughter to work. At the age of nine he bestowed upon her the title of Vice-President of Photocopying. She even had her own business cards and a pay cheque based on an hourly rate - albeit one quite a bit below the legislated minimum. While it made for a humourous anecdote he often used in his speeches, it also spoke to his belief that it is critical to acknowledge the importance and contribution of each and every team member. I thought about that this week as I was reflecting on the depth and richness of the many teams I’ve worked with over the years. In one conversation I remember telling one staffer named Rose that we should make her vice president of nurturing. She said she had often been referred to as a den mother but that she sort of liked the VP title. The discussion was a reminder that the best teams really are those that have different strengths. Being able to build a dynamic team - a group of individuals capable of pulling smoothly in the same direction - is important for all leaders. As such it requires understanding that people are different and differences are essential. Those who have skills and abilities, approaches, and leadership and communication styles different from your own aren’t deliberately trying to annoy you – they are simply different and different is good. It is of course impossible to divide the entire population into four personality styles but many assessment tools are based on findings that do just that. Impacted by the research of Myers-Briggs, the four styles are determined by whether an individual is more oriented to people or to tasks and goals, as well as whether a person’s temperament is more extroverted or outwardly public, or introverted and private by nature. There are Nurturers, like Rose, who have a high tolerance for almost everything and keep people calm. They pay attention to feelings, are sociable, enjoy the company of others, and are friends with everyone. They are usually good listeners, non-competitive, and willing to take direction. Nurturers respect effective leadership, and are often happy building someone else’s design rather than creating their own. In addition to needing a Nurturer, there are other roles that will be important on every team. These include Energizers, Researchers and Organizers. Energizers are charismatic, buoyant and full of life. They are open to new ideas and invitational to people. These are people who approach tasks and projects with great enthusiasm and energy. They will demand the freedom to work on their own, or volunteer to lead. Energizers enjoy competition and all out excitement. Because they enjoy being around people they are often the catalysts for moving the team forward. Every team needs an Organizer as they are typically the dynamos who get things done, They are action-oriented, strong-willed people who always seem to get a lot accomplished in a short time. Organizers often have endless ideas, plans, and ambitions. And, they are also capable of keen insights, practical decisions, and sound judgment. Organizers place high regard on traditions, hierarchy, and clearly defined roles and expectations. They are attentive to detail, enjoy routines and systems, and are also usually the first to notice if a protocol or formality has been breached. Researchers are also important to a team because they are conceptual thinkers who seek knowledge and understanding and like to solve problems or deal with that which is innovative by exploring ideas or developing models. Researchers have exceptional analytical abilities and are able to easily foresee a project or proposal’s potential obstacles and hidden dangers. 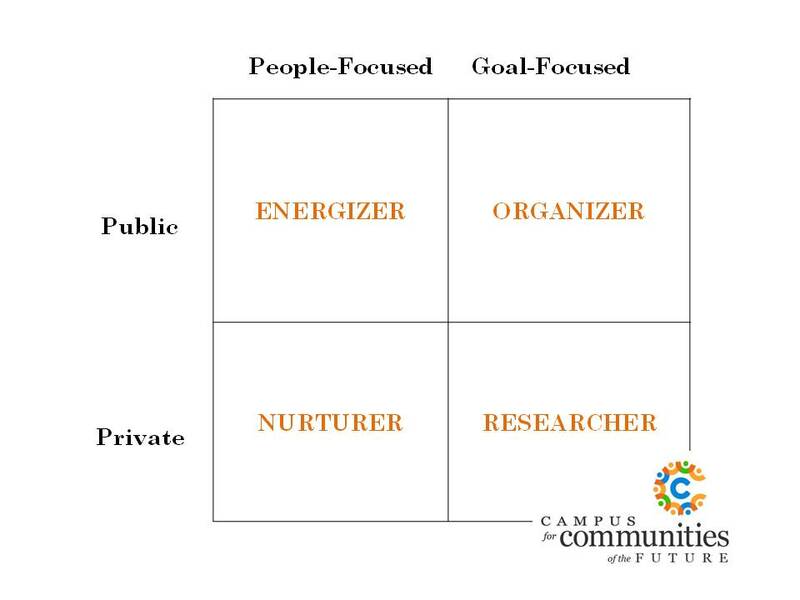 Nurturers, Energizers, Organizers, and Researchers. Each is important because each brings different strengths to the team. If one begins to study the most effective teams, it becomes clear they will be the ones that have all four roles represented. Identify the role you play on your team as well as who might be missing and, while you might not end up as the vice-president of photocopying, you will have a team that fires on all jets.